Barn Wood III- Smitty's Return. One of the cool things about this type of publication is that we can report in real time. So in a sense, if you are reading this, you are sharing in the discovery of hidden treasures as it is happening. The story on Barn Wood was only to be a one day deal. And then two. Late last night this came in. Smitty! While the folks from Lake Oswego Boat Co were inspecting the boat, this name came out of the past.. Presumably to tell the inspector, “Hey, I inspected this, and if my name is still here, I stand by it, so get out your can of varnish and do what ya gotta do.” OK , I am putting words in Smitty’s mouth, but it’s cool as hell that this sort of thing would pop up. And makes the journey of discover even more fun. 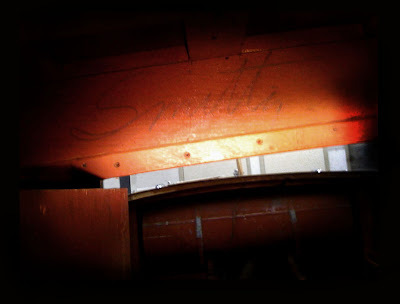 So… Who is Smitty? Is he a worker, is it the ghost of Christopher Smith? Or was it the name of the boat? The writing looks a lot like some of the writing on many of the Hull Cards I have seen. If you know, comment away. We are now all invested in this, and while here on Woody Boater, we can all be in a little way, right there with Paul and Karen while they unrap this gift from the past. The New Classic Boating Magazine Is Here! Joe Martel Aint Gonna Be Happy! FENDER CLEATS! More On Golden Pond Hardware CSI. We Never Noticed! Is There An Official Ruling On Fiberglass Bottoms On Woody Boats Yet? Do we know which plant manufactured the boat? I know Cadillac made a large number of utilities but I don't know about the larger sedans. Holland? Chris Smith would have been about 20 years old, he may know? If we're all involved do we all get to use it? Will there be a signup sheet? Even if not this is still a great story. Mike Green is going to check with Chris Smith for us and see if he has any ideas. We should have the hull card today or tomorrow, but as of now I don't know exactly where it was built. A fun little discovery, to be sure. Will shirts be available in time for spouses to get before Xmas? Just look for the poster that says Speedboat Rides – .50 Cents "Anybody have change for a dollar?" My 25SP was built in Cadillac then finished in Algonac. I was in Flathead lake wearing my Woody Boater t-shirt last June. Missed the boat, literally. Now Matt rubs it in daily!